You’re a savvy shopper, a well-educated consumer. You know to shop around to look for the best price on something before you fork over your cash. And after doing all your homework, you find out from Facebook that a friend on the other side of the country got the same item from the same website for less than you just paid. Why? How? Because an algorithm decided how much each of you should pay, and there’s nothing you can do about it. We’ve covered dynamic pricing, and the ways in which websites can alter who sees what prices, before. But as ProPublica’s Julia Angwin points out in a video today, it’s super hard to research exactly what those differences are and how they affect people, because the entire thing is just one big closed black box. Pricing online is more fluid than most customers think, Angwin says in the video. While we all know that, for example, airline prices can fluctuate day-to-day, far more prosaic items can also have different value from moment to moment. 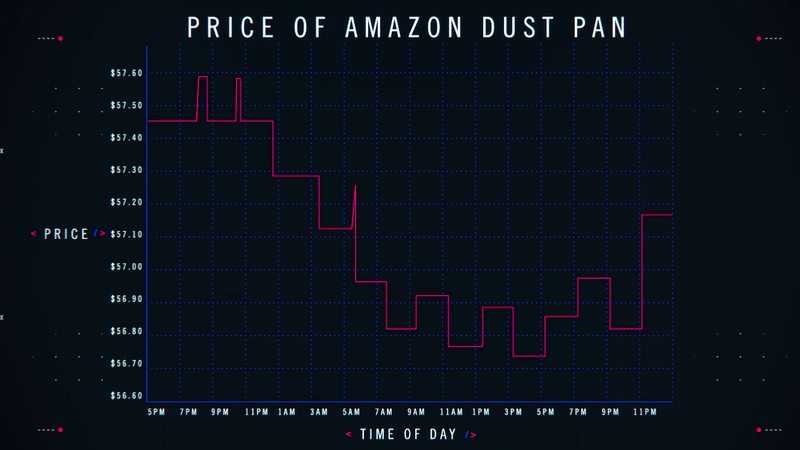 ProPublica’s price tracking of an item on Amazon during the day. Unsurprisingly, an entire cottage industry of sites providing Amazon price tracking has shown up in response. But even using those third-party tools, consumers may still have a hard time knowing what the “true” price of something really is based on other factors. Aside from time-of-day fluctuation, some known cases of clear price discrimination have been identified. There was that time when Orbitz got spotted pushing higher prices for Mac users in 2012, for example. Later research has also shown that Staples’ website presented higher prices on identical goods to consumers visiting the site from lower-income areas, and credit card companies like Capital One also present different card offerings to users based on the ZIP code they’re accessing the website from. And those ZIP code differences can add up into a big, if unintentional problem. ProPublica itself discovered last year that the Princeton Review, when charging for online SAT prep by ZIP code, ended up charging customers in heavily Asian-American areas significantly more than everyone else on average, even when controlling for income. It’s something you can try to see for yourself with a little patience, some ingenuity, and the help of a few friends. Search for something — airfares, credit card offers, a stapler; whatever — on your regular browser. Then clear all your cookies, start a new private or incognito session on a different browser, and run the same search again. Then do that same search on your phone. Run it both from home and from work. Have a friend not in the same geographical area as you run the same search, and do the same new-browser test, from someplace else and compare results. With so much “mass customization” out there influencing everything you see, Angwin points out, research is hard to do. Your browsing history, what ad trackers and cookies are present, how you navigated to a site, what device you’re using, what other apps are on that device, what network you’re on, what OS you’re on, what browser you’re on, which of 43,000 ZIP codes you’re standing in, any other associations that software may have made about you — that all adds up into the whole. And in a nation of more than 320 million people, well, there are going to be 320 million unique digital clones out there, getting processed. Given all that, the results you see are so highly customized that wide-scale, carefully controlled research is extremely challenging at best. Basically everything is a confounding factor. And when pricing can change not just from day to day but from second to second, tracking the accuracy and consistency of results is tricky too. In the end, while all that data might allow you to find out more specifically about how price discrimination is happening, pricing, websites and companies can all change faster than rules and researchers can, so getting a clear picture of, well, anything really is hard to do. As for any regulation here, that’s likely years off at soonest. The FTC has been looking for research and making inquiries about all these hidden models for years, but no proposed guidance or rules have come as a result of all that digging as yet.